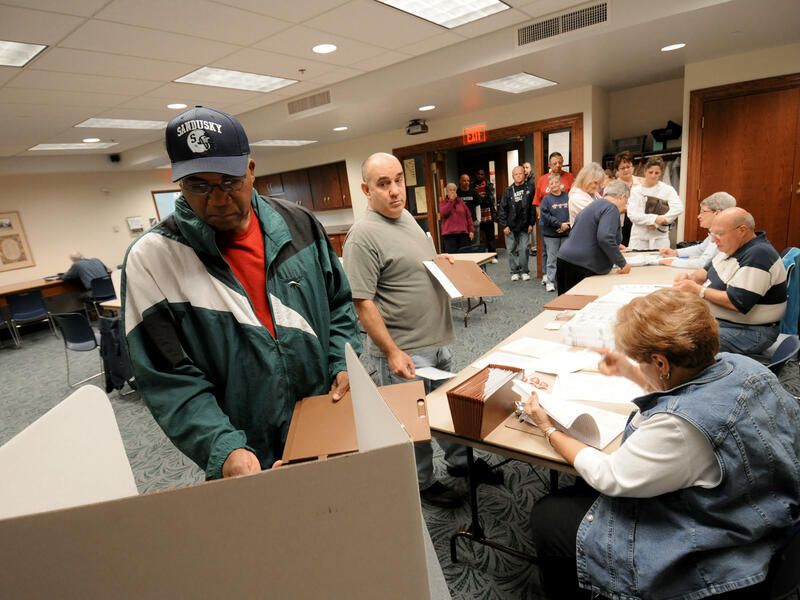 Commissioners in Sandusky, Ohio, have voted to make Election Day a city holiday, in place of Columbus Day. Sandusky resident Moses Croom is seen here voting at a polling station at a local library in November 2008. Sandusky, Ohio, is a small city on the shores of Lake Erie. It's best known among Midwesterners as the home of Cedar Point, an amusement park famed for its abundance of roller coasters. But last week city leaders took steps that could make Sandusky known as a leader of democracy, too: They declared Election Day a paid holiday – by swapping out Columbus Day. "A lot's happened in the last three years that had us thinking a lot about voter access and democracy, and so we thought it was a really natural switch," Sandusky City Manager Eric Wobser tells NPR. The move was first reported by the Sandusky Register. In a national political climate where so much is fiercely contentious, was the holiday swap really as easy as that? Wobser says it was, and it wasn't. In 2014 negotiations with the unions that represent police, firefighters, and municipal workers, the city suggested dropping Columbus Day, but giving up a paid holiday was a non-starter, Wobser says. So when negotiations for 2019-2021 started up last year, the city had a new proposal: replacing Columbus Day with Election Day. "Participation in the government at all levels is essential for everyone," says Ed Dayringer, president of Local 1519 of American Federation of State, County and Municipal Employees, which represents 97 of the city's employees. He's also an engineering technician with the city. "As a city, we want to ensure to give our people the opportunity to get out and vote," he tells NPR. The biggest sticking point in the negotiations was that most people would rather have a three-day weekend than a Tuesday off. But after talking through the larger civic purpose behind the change, all parties agreed to it. After that, it was just a matter of changing the legislation that governs observed holidays. "We did that with an emergency vote that took place and was passed unanimously on first reading at our last meeting," Wobser says. "And ultimately we have gotten very little pushback about it." Police and firefighters will still work scheduled shifts and receive holiday pay for the hours they work, as they do on other official holidays. "Our city's growing and evolving with the times," Dayringer says. "I think we have a lot of forward thinking here at the city, and that's probably what sparked a lot of the change." Sandusky, with a population of about 26,000, is 69 percent white, 23 percent black, and 7 percent Hispanic or Latino. American Indians comprise only 0.4 percent of the city's population, according to the Census Bureau. There have been ongoing national conversations about the issues with honoring Christopher Columbus, a name that many have come to associate with the oppression of indigenous peoples. Indeed, a number of cities have renamed the second Monday in October as Indigenous Peoples' Day. But Wobser isn't aware of any other U.S. cities that have moved to stop observing Columbus Day and replace it with an Election Day holiday. "One of the things that we really pride ourselves strongly on Sandusky, is we're probably the only urban city in a few county area in this part of the state," says Wobser. "And we want to be mindful of and prideful about our diversity in the city, and really kind of celebrate the diversity in the city. So we look at a variety of ways in which we can become more welcoming, and ultimately focus on that." He says the change was partly about addressing the challenges presented by Columbus Day, but also about embracing a chance to "think globally but act locally" to improve voter access on Election Day. "We don't have to wait necessarily for states or the federal government to make this change, but that ultimately cities can do it in a case by case basis," he says. "And you never know — in a place like Ohio, which obviously can often be considered a swing state, if enough cities were to make a move like this, maybe that's enough to tip the scales in an election one way or the other." The change so far only affects Sandusky's 250 city workers. Wobser calls it a small gesture, but an important one. "This will make it a little easier for them to vote, and potentially participate in democracy in other ways on Election Day. But we're very hopeful that the message that it sends will be contagious." There’s a law that’s been on the books that designates part of Election Day as a state holiday, but one Democratic state lawmaker says it’s not being followed. 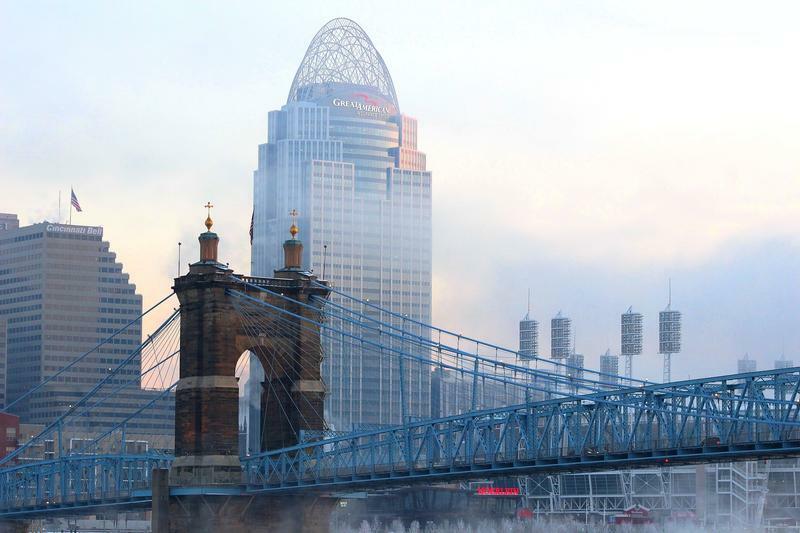 The Queen City is giving Columbus Day a makeover. The Akron City Council has voted to kill a resolution that would have changed Columbus Day to Indigenous Peoples Day. The city of Oberlin, southwest of Cleveland, will celebrate the second Monday in October as Indigenous Peoples' Day instead of the federally recognized Columbus Day holiday.